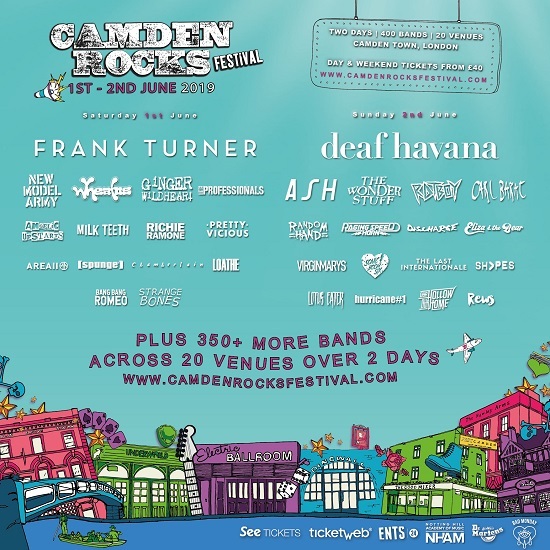 Deaf Havana have been confirmed as headliners for the Sunday night of Camden Rocks. They join Frank Turner And The Sleeping Souls, who top the bill on the Saturday of the new-look two-day festival. A total of 27 additional acts were announced this morning, including Our Hollow Our Home, Sworn Amongst, Modern Error and Glass Peaks, who join a line-up that already features the likes of Ash, Richie Ramone, The Wonder Stuff, Rat Boy, New Model Army, Wheatus, Carl Barat, Ginger Wildheart, The Professionals, Milk Teeth, Pretty Vicious, Raging Speedhorn, Angelic Upstarts, The Virginmarys, The Last Internationale and many many more, bringing the number of bands playing over the course of the weekend of 1-2 June to a total of 240. Day or weekend tickets are available HERE.